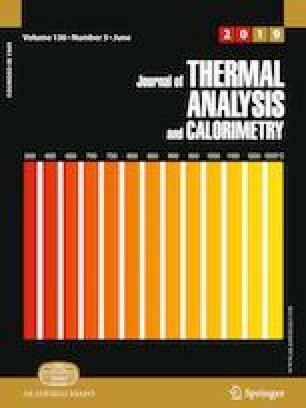 To analyze the feasibility of phosphorus-containing ionic liquids used as flame retardants on flammable materials, thermal stability and pyrolysis kinetics of 1-butyl-3-methylimdazolium dibutyl phosphate ([Bmim][DBP]) were investigated using nonisothermal thermogravimetry. The apparent onset decomposition temperature (T0) and mass fraction of residual carbon were 275.2–297.3 °C (± 0.5 °C) and 8.6–10.2% (± 0.1%), respectively. The apparent activation energy (Ea), pre-exponential factor (A), and most probable kinetic function [G(α)] were calculated using thermokinetic methods as Ea = 152–164 kJ mol−1 (± 2 kJ mol−1), ln A = 27.7 ± 0.4 s−1, and G(α) = − ln(1 − α). The maximum operation temperature was estimated as 166.0 ± 0.2 °C, which was considerably lower than T0. The pyrolysis products were identified through gas chromatograph/mass and Fourier transform infrared spectrometers. As a novel finding, the main flame-retarding mechanism of [Bmim][DBP] occurred primarily in condensed phase. Complementally, [Bmim][DBP] was testified to have the flame-retardant effect on epoxy resin by limited oxygen index and vertical burning tests. This study was very grateful to be supported by the Process Safety and Disaster Prevention Laboratory, Postgraduate Research and Practice Innovation Program of Jiangsu Province (KYCX17_0915). The authors appreciate the original suggestions and heartfelt inspiration for provided by the members of IL research groups.